TV5 is bringing another first to Philippine free television! After its unmatched sports coverage of the Philippine Basketball Association (PBA) season, fearless news reporting segments and its unique Tagalized versions of popular US television series, it will now give the Filipino audience the brilliance of a world-class director right in their homes. Last December 19, 2016, TV5 proudly announced its collaboration with acclaimed director Brillante Ma. Mendoza for its newest offering, Brillante Mendoza Presents. The show will feature made-for-television movies created exclusively for TV5. 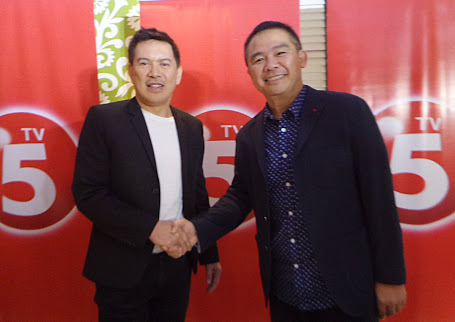 During the presscon of TV5 - Direk Brillante Mendoza partnership with TV5 executives, Lloyd Manaloto, Head of Digital 5 and Network Marketing, Chot Reyes President of TV5 and Mel Yazon TV5 First Vice President and head of programming and acquisition. Direk Brillante shared films made for television that will be shot in different parts of the country, according to him the first film will be shot in Binondo, Manila. The film will tackle about the Chinese new year; all we know that the Chinese are very significant to our country. The next film will be shot in Baguio and others will be in Mindanao, Davao, Tawi Tawi where the story are based in a specific place in the country. The name Brillante Mendoza is synonymous with excellent films that reflect the unfiltered realities of society. Viewers can expect the same quality of storytelling and craftsmanship in Brillante Mendoza Presents. For TV5, this is a testament to their commitment to provide viewers with shows that raise the level of free TV entertainment. Brillante Mendoza has been making the rounds of international film festivals since his first movie Masahista in 2005. He is the only Filipino to have won Best Director in the prestigious Cannes Film Festival for his feature film Kinatay, a story of a young man who suddenly finds himself in a criminal syndicate. Most recently, his film about a small-time drug dealer in dire need of bail money, Ma’ Rosa, earned a Best Actress award for the Jaclyn Jose at the Cannes Film Festival. Brillante Mendoza’s success in the international arena has given so much pride for the Philippines. With Brillante Mendoza Presents, TV5 is giving the director another space to feature his work and reach out to Filipinos from all walks of life. The stories will be authentic and unique, definitely a far cry from the usual TV dramas. Brillante Mendoza Presents will air once a month starting January 2017 on TV5. Don’t miss out on this one-of-a-kind opportunity to watch the work of a true film master. Tune in to TV5 for more updates on this new program!